The global market for retort packaging is extremely fragmented with the top ten players accounting for over 30% in 2015, states Transparency Market Research (TMR) in a research report. The core success strategy for the market players is achieving differentiation through innovation in the design and features of the products in circulation in the market. For instance, one of the primary players in the market, Mondi group, developed retort stand-up pouches for the segment of pet care products. It has a high-definition rotogravure photogravure feature. The prominent players operating in the global retort packaging market are Flair Flexible Packaging Corporation, Clondalkin Group, Winpak Limited Company, Ampac Holdings LLC., Berry Plastic Group, Inc., Sonoco Products Company, Coveris Holdings S.A, Mondi Group, Sealed Air, Bemis Company, Inc., and Amcor Limited. 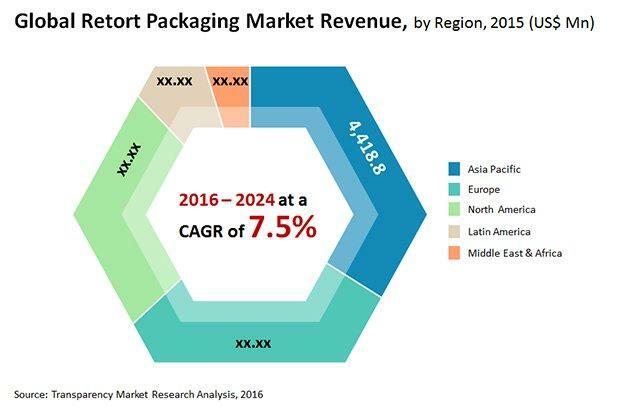 According to a TMR author, “The global retort packaging market is expected to exhibit a 7.5% CAGR from 2016 to 2024. In 2015, the market was worth US$13,026.9 mn and is expected to rise to a valuation of US$24,706 mn by the end of 2024. Based on varieties of products, the global retort packaging market can be segmented into bottles, cans, cartons, trays, and pouches. Among these, the segment of retort pouches likely held a share of 45.8% in 2016 and is likely to retain its dominance in the years ahead. This segment is expected to be driven by their flexible characteristics and the employment of heat resistant plastics which are suitable for being processed at temperatures such as 127 °C during the time of their manufacturing. The adoption of retort pouches has not only observed a rise at the customer end, but also from the end of the producers and industries of late. The intensifying popularity of this particular trend can be credited to the growing availability of transparent AlOx-coated polyethylene terephthalate (PET) film which is an ecologically friendly material used for packaging, which have the ability to be employed in microwaves also. Furthermore, the stand-up variability of retort pouches almost 5% lesser materials for packaging in comparison to aluminum cans and trays, whereas also adhering to the sterilization obligation of the package at given lower temperature. Region-wise, Asia Pacific is anticipated to provide incremental opportunities for the development of the market in the coming years. In 2016, it accounted for a share of 34.0% in the global retort packaging market. Europe and North America is expected to closely trail Asia Pacific. With the massive rise in the consumption of packaged and processed food products globally, there has been a substantial boost in the demand for multipurpose and decent quality packaging technologies and materials. Retort packaging has surfaced as a suitable choice against numerous conventional packaging technologies owing to its competence of meeting the essential principles of food packaging such as aesthetic appeal, ease of use, low weight, extended shelf life, and upholding food hygiene and safety. Furthermore, due to the point that retort pouches employ only about 5% of the packaging material as compared to traditional cans, the change to retort packaging from conventional packaging is an extremely advantageous and lucrative move for the manufacturers of packaging materials. Consequently, retort packaging is expected to witness a huge gush in its demand from manufacturers as well as consumers. The need for eco-friendly packaging is also expected to support the growth of the market.